An airline employee at Sea-Tac Airport stole an aircraft and crashed in South Puget Sound. The airport said the employee carried out an "unauthorized take off" in a statement on Twitter. 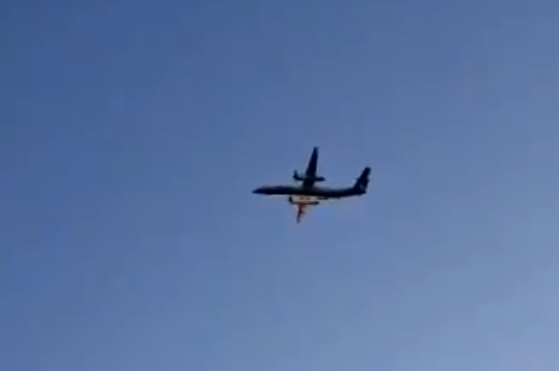 Witnesses took video of the aircraft being chased by a fighter jet as it flew loops above Seattle. The airline confirmed no passengers were aboard the plane which was an Alaska Airlines Q400 passenger airplane. The employee eventually crashed on Ketron Island in southern Puget Sound in what is believed to be the first aircraft theft to end with a crash. The Pierce County Sheriff's Department said the employee who stole the plane was "a single suicide male" and that there were no passengers aboard the plane. They also confirmed "this is not a terrorist incident" adding, "Preliminary info is that a mechanic from unknown airlines stole plane. Was doing stunts in air or lack of flying skills caused crash into Island." A spokesperson for the Federal Aviation Administration (FAA) called the incident a "security issue" involving SeaTac airport. Alaska Airlines also addressed the crash saying, "We are aware of an incident involving an unauthorized take-off of a Horizon Air Q400. We believe there are no passengers on board. More information as we learn more." A Twitter user managed to record radio chatter of the airline employee who stole the plane saying the people that care about him will be disappointed. This is so sad. Mental health issues for sure. Wish it had turned out differently. Sounds like he didn't want to hurt anyone. Very sad, very scary to think it could even happen.